Sciblogs | Is this a Conversation worth having? Is this a Conversation worth having? There’s a new player in science communication that has emerged across the Tasman, in the form of The Conversation, a website backed by numerous Australian universities and overseen by a highly experienced team of journalists and scientists. I’ve known The Conversation was coming for some time – our colleagues at the Australian Science Media Centre are a supporting partner. It is an interesting and promising concept – one that has emerged as people seek out a proliferation of alternative sources to mainstream media coverage of science. So what’s the deal? The Conversation is a Melbourne-based web start-up featuring content written by scientists, finessed by trained journalists and presented directly to the public. It is essentially a reaction to the media’s lessening ability to do coverage of science-related issues justice. It has the financial backing of ANU, Monash, Melbourne, UTS, UWA and the CSIRO to the tune of millions of dollars per year and counts those organisations plus a hardful of others among its content partners. The idea is that The Conversation‘s journalists set the editorial agenda and seek out experts at the scientific institutions to come up with articles and opinion pieces. 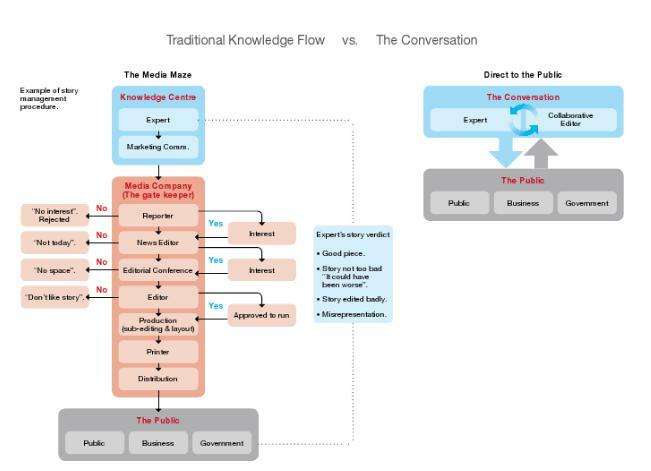 This graphic nicely sums up how The Conversation differs from the mainstream media. That could be a recipe for dry, highly-technical pieces from academics, but out of the gates The Conversation is generating interesting, well-written and even controversial material. The hidden hand of seasoned journos shines through in the writing, which so far has covered subjects as varied as the Google Books court reversal and a neuroscientist’s view on “chiropractic quackery“. The experts featured so far form an eclectic group. There are disclosure statements to cover off potential conflicts of interest and discussion is encouraged with comments open on each article and Creative Commons repurposing of the content endorsed. The editorial team at The Conversation is headed by Andrew Jaspan, former editor of The Age, The Observer (London), The Scotsman and Scotland on Sunday. That amounts to some serious journalism experience in Jaspan alone. A team of around 18 makes up The Conversation, though a number of them seem to be part-time assistant editors. As such however, The Conversation represents probably more resourcing in science journalism and communication than any media organisation in Australasia is committing – barring possibly the ABC. But will it work longterm? The public still gets 90 per cent of its information about science from the mainstream media – newspapers and magazines, TV and radio broadcasts and the online portals of those organisations. The Conversation is a new player that seems to be committed to high-quality content. What it doesn’t have however, is a large audience to put that content in front of. Its readsership will increase over time, but The Conversation will likely need to forge content-sharing partnerships with media organisations for its content to gain traction with the wider public. This isn’t as hard as it sounds, and The Conversation already has AAP as a strategic partner, suggesting some content sharing with the newswire service is in the pipeline. At Sciblogs, we’ve found that articles written here can quickly catch the media’s attention. Today alone, nutritionist Amanda Johnson was on radio and TV on the back of her piece about the influence of marketing on children’s perceptions of food. Since late last year, Sciblogs content has been syndicated via the New Zealand Herald website and occasionally Stuff and NBR. Coverage by our bloggers of the Ken “Moon man” Ring affair pushed Sciblogs traffic last month above the 100,000 visitor per month mark for the first time. So there is mainstream media appetite for good quality content and increasingly, editors are deciding to reach out to bloggers and op-ed writers to supplement their own coverage. This is a good thing and something The Conversation will, I think, find it easy to exploit. The problem is the media are rarely willing to pay for such content, which is leading to a preculiar thing – where some specialist areas of journalism, such as science journalism and investigative journalism, are starting to be funded by groups outside the mainstream media. The Conversation is a prime example of this. Sciblogs, which was intially funded by the New Zealand Science Media Centre to some extent is also an example of that. In the area of investigative journalism, US not for profits, the Center for Public Integrity and ProPublica are examples of this. All of the above area funded by Government, public institutions, philanthropists or a mix of all three. So we are starting to see a shift in the media landscape where resource-intensive journalism of complex issues is being taken up and funded by third parties. That reflects the commercial reality of the state the media is in at the moment, but isn’t necessarily a bad thing. As long as the quality and independence of content can be maintained, who cares where it comes from? But the issue of independence shouldn’t be underestimated and The Conversation, like Sciblogs and any other organisation seeking to put out credible information should never the importance of independence – both real and perceived. Editorial decisions need to be made independently of the organisation’s financial backers. So far so good for The Conversation. The content is making me stop and read, the site looks pretty good. It arrives at a time when major science-related issues of public concern (the tsunami and nuclear situation in Japan, extreme weather events in Australia etc) require effective explanation on the part of experts. This venture facilitates that and therefore shows a lot of promise. So yes, a conversation that is indeed worth having.